Dried plums boost the flavor and nutrition of this delicious flatbread that’s sure to be a hit with your family. Did you know that May is National Osteoporosis Month? To kick off the month and raise awareness for this worthy cause, the California Dried Plum Board decided to challenge us Recipe Redux members to create delicious recipes highlighting this nutritious and versatile dried fruit. postmenopausal, osteopenic women. In addition, dried plums are low in calories and fat and are packed with several other important nutrients like fiber and potassium that are beneficial for heart health, digestive health, immunity and healthy aging. Dried plums are a very versatile ingredient and are natural flavor enhancers. They can be used to boost the flavor as well as the nutritional value in a wide variety of dishes, both savory and sweet. You can even used pureed dried plums to replace some of the butter or oil in baked goods, to reduce the calories and fat. Because they’re naturally sweet, you can also cut down on a significant amount of sugar. For this challenge, I wanted to create a unique recipe using ingredients and flavors that would highlight the dried plums. 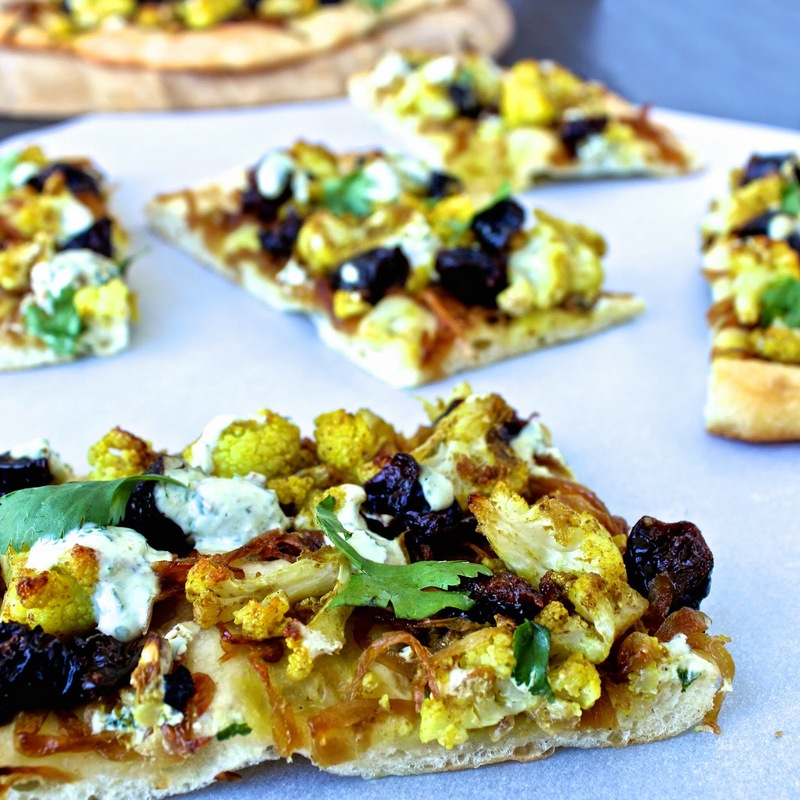 I love the combination of sweet and spicy flavors so I came up with this Spiced Cauliflower, Dried Plum and Caramelized Onion Flatbread. I toss cauliflower florets with curry powder and roast them in the oven until golden. Then I sprinkle them on top of pizza dough with sweet dried plums and caramelized onions. The dish is tied together by a creamy cilantro yogurt sauce that gets drizzled on top just before serving. When you take bite, you get a burst of flavors- spicy, sweet and tangy all in one. It’s dried plums like you’ve never had them before! Dried plums boost the flavor and nutrition of this delicious flatbread that's sure to be a hit with your family. Mix 2 tablespoons oil, curry powder and ¼ teaspoon salt together in a medium bowl. Add the cauliflower and toss to combine. Spread the cauliflower out on a baking sheet and bake in the oven 10-12 minutes. Turn the oven up to 450°F. Place the pizza dough on a lightly greased baking sheet and stretch it out to a rectangle about ¼-inch thick. 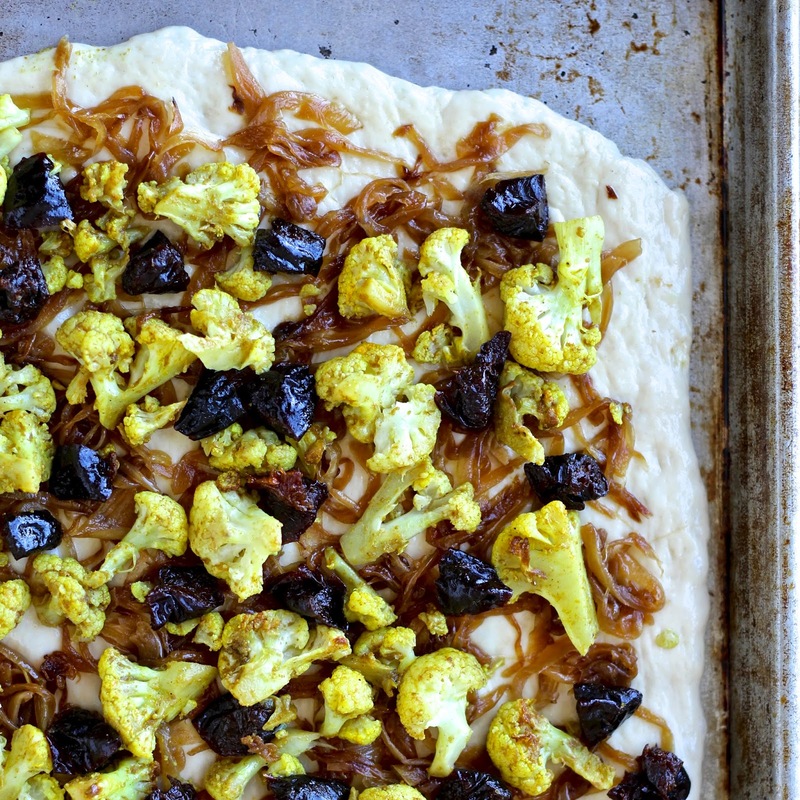 Spread the caramelized onions over the surface of the dough and arrange the spiced cauliflower and dried plums on top. Bake in the oven until crust is golden brown, 10-15 minutes. Make a cilantro yogurt sauce by blending the yogurt, cilantro, lemon juice, water and 1/8 teaspoon salt in a mini food processor or blender. Drizzle some sauce on top of the pizza and serve any remaining sauce on the side. Cut the flatbread into pieces and serve. Check out below to see what the other Recipe Reduxers did with this fun challenge! Forserious, I've think you've outdone yourself–this looks beyond the realms of amazing. *-* I need this in my life! <3! Wowza – loving this loaded flatbread – the colors! Simple yet delicious! Love a new way to eat cauliflower! What a delicious and creative way to use the plums! Love it! Mmmm – who would think to pair curry and cauli AND plums???? Not me!!! Oh. but you did!!! I am so intrigued by this – it sounds wonderful, Sonali! And GOOD LUCK!!!! Thanks so much Shashi! And good luck to you too- your cookies look amazing! this looks so good..i love roasted cauliflower by itself but with all these other deliciousness, i bet it will be even better. This looks amazing Sonali!!! I love all of the flavors you put together, I would love a slice of this flatbread right now!! I love the flavors you added to my FAVORITE food: pizza! The color is perfect too. I bet the creaminess of the cheese and the sweetness of the plums was fantastic! Coming from a such a pizza lover, these means so much to me! Thanks Katie! LOVE all those flavors and what a clever use for dried plums! This flatbread definitely has some unique flavors – YUM! Loving the curry in this, and of course, those beautiful dried plums 🙂 Pinned! Thank you my friend! I promise you the combination is delish! I would have never thought to add dried plums this flat-bread It looks amazing and full of nutrition! What great flavor combinations!! Looks amazing! This looks beautiful! I am a fan of prunes (but not calling them dried plums). My favorite way to use prunes is in a Moraccan tagine. Haha, I hear ya about the name change 😉 Thanks for stopping by! Seriously, Sonali- I have no words, BEST looking pizza and you literally made it that much more perfect with the spiced cauliflower- You better win! Haha, thanks Arman! I hope you're on the voting committee! 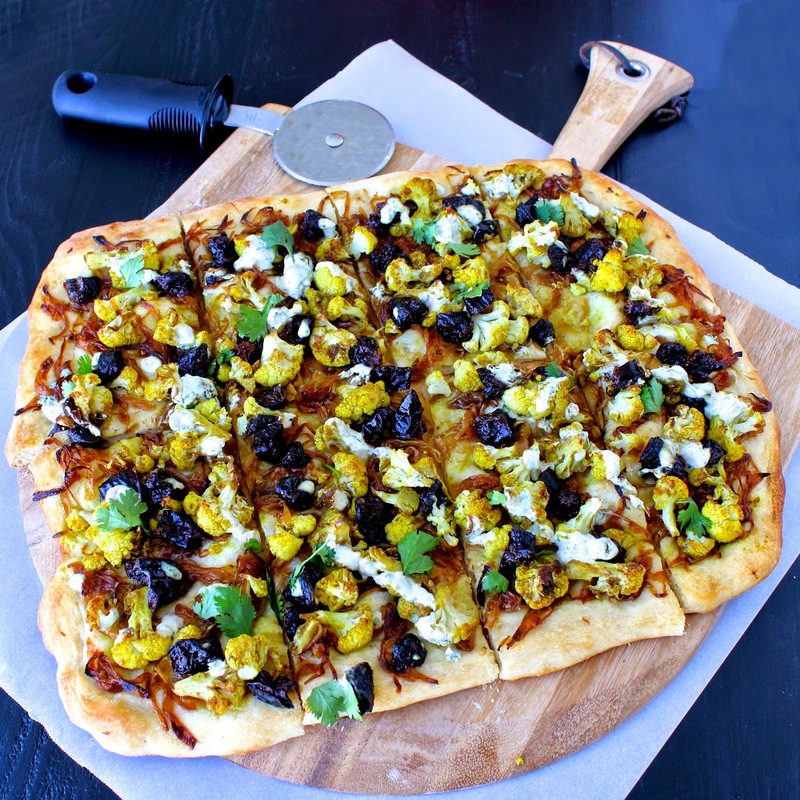 Sonali, I love all the sweet flavors of the dried plums and caramelized onions in this flatbread. 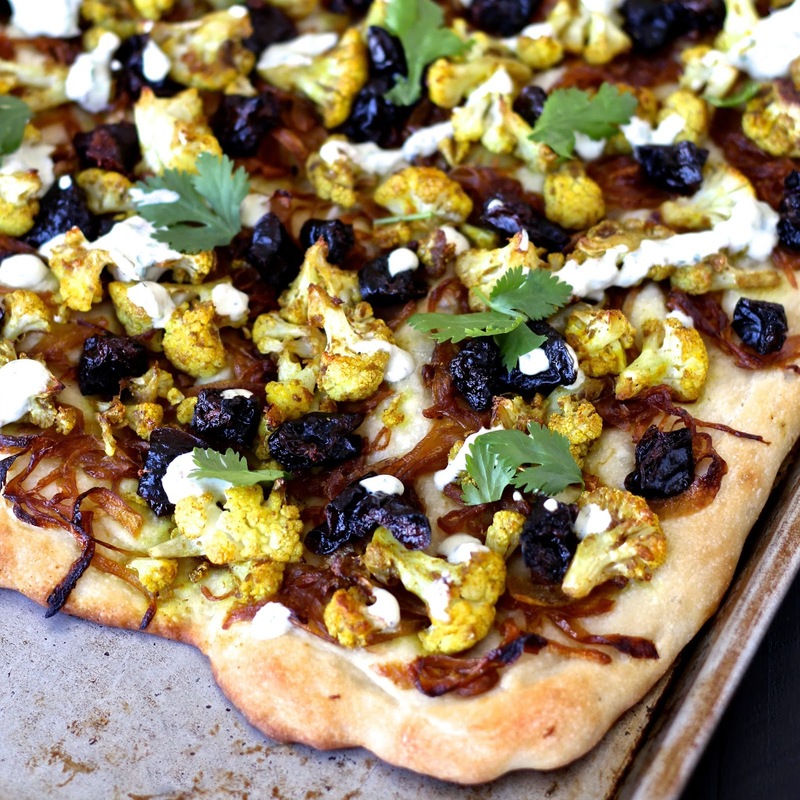 Cauliflower sure doesn't pop up on flatbread recipes too often, when it clearly works! Wish I could have a bite of this! SO creative and delicious! I'd love to make a gluten-free version of your flatbread. Fabulous!! Thanks EA! I'd love to hear how it turns out if you give it a try! This is so great! I love prunes, and I love funky pizza / flatbread combinations, so this is a match made in heaven. Definitely going to try this out, thanks for the recipe, Sonali! I love love love the sweet and savoury combo going on here! OEMGEE – Congrats Sonali – I saw you won runner up with this amazing recipe!